We may not turn into Werewolves during a full moon, but we certainly feel like the timing and the setting is perfect for the transition from normal to crazy. Strange things seem to occur during a full moon and people definitely show signs of being a bit ‘off’, with no mystery that the word Lunatic stems from the Latin word ‘Luna’ which means ‘Moon’. For hundreds of years, the moon has been regarded as a powerful entity and beliefs that the moon has the power to change and control human biology and behaviour persist. How can something that sits so high in the sky and so far from our planet have such a huge impact on us humans? The phases of the moon affect the tides of the oceans. The oceans are dependant on the strong ‘gravitational tugging’ of the moon on the earth. The moon and earth are attracted to one another like magnets. The earth cannot hold onto water because it is always moving, the moon is able to affect it, creating two tides per day approximately 12 hours apart. During the full moon and the new moon, the high tides are very high and the low tides are very low. Conversely, during the quarter moons, the high and low tides are not significantly affected. This allows the water levels of the ocean to remain somewhat neutral. The gravitational pull of the moon on the earth during a full moon or new moon is stronger on the side that is closest to the moon causing the high tide. The opposite side of the earth that is furthest from the moon’s tugging will experience low tide. All bodies of water on planet earth are constantly in motion and cannot remain fixed to earth allowing the gravitational pull of the moon on the earth to create fluctuations in water levels which are high and low tides. With this knowledge, we can understand how the phases of the moon affect people and ultimately affect our health. Since we are made up of 70 percent water it is no wonder that the gravitational pull of the moon on earth will cause some type of reaction in our body. Below I will outline a few of the effects the moon seems to have on us and how we can maximize on those benefits during the full moon and new moon. Menstruation seems to be affected by the lunar cycle. According to Christiane Northrup, M.D., during the new moon, ovulation and conception rates are decreased and most women will start their menstrual bleeding. It has been documented that since the moon affects the flow of fluids it can be correlated to a woman’s monthly cycle as well. Some studies have suggested that biological cycles, as well as emotional rhythms, are related to the moon and tides. This is because they interact with the electromagnetic fields of our bodies and therefore our physiological processes. Just as the moon goes through periods of darkness where it is not fully visible and is not affecting the tides, the menstrual cycle goes through a similar pattern. During the premenstrual and menstrual phase, we have reduced energy or drive and feel less motivated. The waxing and waning of the moon provide women with wisdom that is beneficial to their health. By listening to our bodies and following the lunar cycle we allow our natural rhythms to flow so we can rest and recharge as our body needs. Dr. Northrup believes that most women have learned to block the flow of unconscious ‘lunar’ wisdom. This information comes to women pre-menstruation or during their menstrual cycle and is an opportunity to be reflective and tap into our intuitive nature. We can slow down, dig deep into our emotions and redirect our thoughts so that we can focus on ourselves and our health. 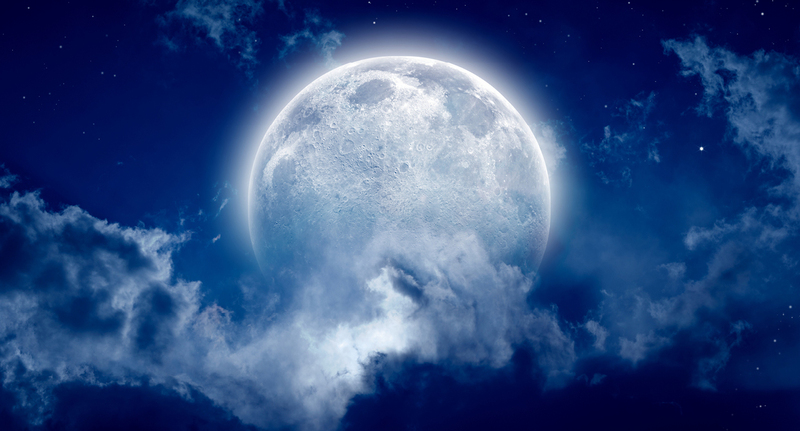 A recent study has found that around the full moon, people get less sleep and that slumber is not as deep as other times during the lunar month. In fact, some research has concluded that for the few days before and after the full moon, sleep is disrupted. During a study conducted in Switzerland, the study participants had brain patterns monitored along with eye movement and hormone secretions while they slept. It was concluded that brain activity related to deep sleep was reduced by 30 percent and they showed reduced melatonin levels (a light-sensitive hormone that helps control the natural sleep-wake cycle). Not to mention that it took the participants five minutes more to fall asleep around the time of the full moon. Most participants also reported that they felt unusually more tired around the time of the full moon. Although the research has pointed toward the moon phases affecting sleep, the questions remain. How and why does the moon affect our sleep? Most researchers don’t think that the gravitational pull of the moon on the earth and water is the reason behind the disrupted sleep patterns. In fact, most researchers feel that it is related to our internal biological rhythm that is linked to the moon’s cycle and has suggested that it is linked to our ‘circadian rhythms’ which are responsible for regulating our biological functions like sleep and alignment with night and day. That in itself is cause for trying to understand why we would need more or less sleep during certain phases of the moon. Think back to the times of hunting and gathering where we needed to conserve energy in the event that we would be up all night trying to catch our next meal it makes absolute sense. During the full bright night moon, we needed to sleep less and hunt more and our DNA knows that. The moon is big and shining brightly during the full moon phase so we can hunt all night, instinctively our melatonin levels drop so we sleep less. After the full moon, we can get back to homeostasis and our bodies can recharge and catch up. Our sleep can be deep and replenishing once again. Studies have shown that mood and behaviour change during a full moon. The theory is that the gravitational pull from the moon affects fluids in our brain. This affects mood and behaviour and has been dated as far back as the Middle Ages where the ‘lunar lunacy effect’ was common. In a Dutch study, the full moon was linked to a rise in psychiatric admissions to hospitals. There were also increases in illness and aggressive behaviours during the full moon phases of the lunar cycle. Now that we know how the phases of the moon can affect our well-being, we can use this power to our advantage and make positive changes for ourselves and take the ‘lunacy’ out of the ‘lunar cycle’. The new moon and the full moon are the most powerful times during the lunar cycle. Depending on your astrologic birth chart, you can maximize on this energy and make it a time of positive transition and change. You can make changes to many aspects of your life. The new moon is a really good opportunity to start something new, make a life-transforming decision. It will give you the power to be more assertive and decisive and more aware of your personal power. When you feel compelled to reflect on your life and formulate ideas for your future that is the influence of the full moon. When anxiety seems heightened and emotions are soaring that may be the effects of an eclipse. The moon affects our oceans and our bodies and therefore our health. We can use the power of these phases to our advantage by understanding what they mean from the perspective of rejuvenation and rebirth. When the moon is indirectly telling us to slow down that is exactly what we should be doing. The slight burst of energy that we experience during the full moon could be a productive time for us to focus on completing projects, spend time with people who inspire us and make changes to ourselves and our lives. If we understand how the tide changes according to the gravitational pull of the moon and how that may affect our mental and physical state then we can follow those phases and understand that it will pass in a few days and better cope with the stress of this period. If we follow the ebb and flow of the ocean and the phases of the moon, we can enjoy life to the fullest.